Lately people have been asking us for where to go to get good information and support for the GAPS (Gut and Psychology Syndrome) Diet. This diet is aimed at restoring the health of the gut, and the balance of the bacteria and fungi that live there. By giving the gut a chance to heal, many health problems can be reduced or eliminated. 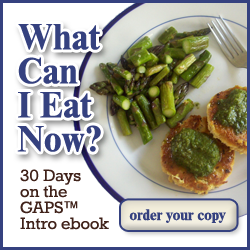 GAPS was based on the Specific Carbohydrate Diet, which eliminates disaccharide and polysaccharide sugars and introduces readily digested, nutrient dense foods. GAPS takes it few steps further by introducing these nourishing foods in a phased approach, focusing more on probiotic foods, and introducing a detoxification protocol. We’ve written up some summaries explaining how to do the GAPS diet, and have a weekly blog carnival where people can share their GAPS legal recipes, GAPS Friendly Fridays! If you’d like more personalized help with making GAPS work for your lifestyle, Mama provides coaching by phone or in-person! Fill out the intake form or email her for more information! When browsing online, you may see recipes posted for the full GAPS diet that are not safe for the initial stages or which include ingredients that are on the “Foods to Avoid” list, since people who start out doing GAPS eventually move on to include other foods. Additionally, when doing GAPS, people will introduce foods at their own pace, so some recipes for your stage may include ingredients you aren’t quite ready for. Make sure to take that into account when choosing which recipes to make. We’re making this easier by providing recipes tagged with the appropriate GAPS stages and sharing our personal experiences with GAPS right here on The Liberated Kitchen. We started the diet before reading the book Gut and Psychology Syndrome by Dr. Natasha Campbell-McBride, MD. We wish we’d read it before starting the diet. We realize now how important actually reading the book is for understanding what’s going on in your body and making decisions about how to proceed with the diet. We also recommend the ebook What Can I Eat Now from Health, Home & Happiness to get you started. Internal Bliss is not as nicely laid out, but is full of GAPS Legal recipes you can enjoy. The Gut and Psychology Syndrome Facebook page is the best forum we’ve found so far for getting GAPS advice in real time. Search facebook – there are new GAPS groups cropping up all the time! There are also a couple Yahoo groups out there – we don’t have a lot of experience with them, but GAPSdiet is one to try. There are several websites for basic GAPS information. The Intro Diet page of gaps.me copies parts of the Gut and Psychology Syndrome book exactly. Gaps.me also has a good FAQ written by Dr. Campbell-McBride. The GAPS diet is based on the Specific Carbohydrate Diet (SCD). To understand this diet, read the excellent book, Breaking the Vicious Cycle: Intestinal Health Through Diet by Elaine Gloria Gottschall. In a nutshell, the foods from SCD are eventually allowed on the GAPS diet, but GAPS focuses on first completely healing the gut. Thus, the SCD legal food list from http://www.breakingtheviciouscycle.info is useful. The nice thing about the SCD list is that it gives you the reasons why certain foods are illegal on the diet, which is nice when you’re trying to figure out why a certain food is allowed or not! There are some differences between SCD and the GAPS diet, so make sure to follow the GAPS diet “Foods to Avoid” list. Here are some good GAPS-related blogs, but don’t expect everything on them to be GAPS legal. Since GAPS is a temporary protocol and not everyone interprets it exactly the same way you may find some differences! Good luck and let us know how it goes! We’re here to help you, too! Feel free to post questions in the comments and we’ll get to them. If you’d like more personal support, please fill out the Coaching Intake Form. Dr. Natasha has started a training program for health care practitioners and nutritionists. Here is a listing of GAPS Certified Practitioners. Since I am not a health care practitioner, I am not able to obtain this certification. I may not be certified, but my family has been on GAPS and strictly gluten-free for a couple years, and I have done my homework! Finding the right coach is not just about knowledge and experience, but also about the right personal connection. If we have that connection, I will be happy to help you and your family make the lifestyle changes and find the medical help you need to choose and implement the diet that is right for you. This is a great, informative series on GAPS. I’ll definitely be adding it to the GAPS resources list I’m compiling. After 16 years of Fibromyalgia I finally healed myself through a combination of GAPS and Acupuncture, and have been trying to blog about my journey. Thanks! It’s great to hear that you’ve experienced so much healing. Please share your resource list with me when you publish it! amindfulparent.wordpress.com Here is another site (my blog) with mounding GAPS recipes!! Thanks for sharing! !